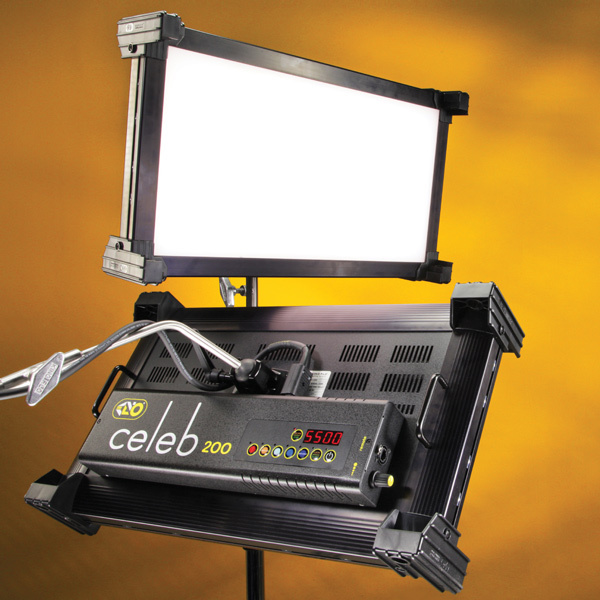 •The Celeb boasts technical innovations that make it an ideal professional imaging tool. With new 250, 450, 450Q and 850 the Celeb line goes full RGBW! •The Celeb RGBW has three Menu options, one white and two color menus. Those who prefer to work with white light can use the "white menu" that gives the user access to Dimming, Kelvin and Green/Magenta control channels. Kelvin range is from 2700K tungsten to 6500K daylight. •In the color menu, the Kelvin range travels from 2500K tungsten to 9900K daylight, and Kino Flo has set up a fourth channel called Gel. The Gel channel includes Kino Flo presets such as blue & green screen, sodium vapor, mercury vapor and over 100 well-known lighting gels. In addition, there is also a fifth channel called Hue Angle and sixth channel, Saturation. 100-240VAC (4.1 Amps at 120V). We also recently added new SnapBag Softbox and SnapGrid accessories. With the SnapBag, the surface area increases in size to 72” x 49” (183cm x 124cm). •The Celeb 200, 250, 450, 450Q and 850 come complete with 360 degree mounting, molded accessory holders, removable gel frame and 60 and 90 degree focusing louvers.